That’s about to change. But first, some background. Back in 2012, the Information Design NYC Meetup group was founded with the intent of bringing professionals, students, enthusiasts, and others connected to the field together to share knowledge, keep current on trends, see what others are doing, and get to know one another. The first event, an evening of presentations by three information design professionals, drew quite a crowd and rave reviews followed. Sadly, activity halted soon after and the group fell into a lull. I’ll admit my involvement wasn’t as active as it could have been. Fast forward to December 2015. I received an e-mail that the group was about to be shut down if another organizer didn’t come forward from among the members. Rather than wait and see what would happen — and potentially let the only information design-specific group I knew of in the New York area fade away if no new organizer appeared — I took a chance and stepped up to the organizer role. It was a spontaneous decision, more emotion than reason, but I think it was the right one. I am extremely happy to say that co-organizer Sheila Pontis and I have officially opened registration for our first event of the year — Information Design: Who, What, Why. It’s intentionally not another show-and-tell or lecture by somebody famous (although we’re planning some of those later on). Nor is it your typical networking event. Instead, it’s a mix of brief presentation and info-designy activities to encourage people to share their own views and personal stories. There’s considerable diversity of thought and practice right here in New York City, and this event will hopefully bring that to the surface. The point isn’t to conclusively define information design in a way that all will agree with, but rather, to reflect what it looks like today in order to broaden awareness and understanding. And have a fun evening making some new friends in the process. How the event pans out and what comes next depends on a few factors, but we’re optimistic. Reviving a platform-based community of interest and running events is like a second job, and a ton of work and volunteer effort goes into just that. Seasoned leaders and planners of other groups we’ve spoken to can attest to that. There are realities on the participant side of such groups: varying interests and interest levels, limited time and energy, competing commitments, etc. Our hope is that there are people who care enough to not only come to events but to help build the community by leading and contributing to conversations, offering guidance to newcomers, teaching what they know, proposing event ideas, and finding new ways to make the group better. 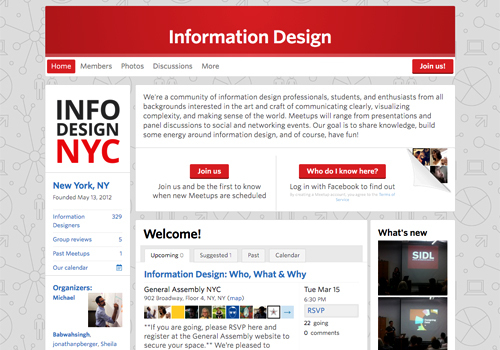 So, if you’re interested in information design and you’re in the New York metro area, consider joining the Information Design NYC Meetup group. These are the folks you want to hang with if you’re interested in information design.